Do you struggle to get your brain ticking in the morning, or just find that you’re most productive after you’ve gulped down your first coffee of the day? Maybe you’ve found that you have the best ideas at night, or you’re like the vast majority of us that experience that dreaded 3pm slump? Either way, whether you’re bright eyed and bushy tailed at dawn, or find that you’d be more accurately described as a ‘night owl’, we all have a Power Hour, that certain time of day when we work our best. Although you may not be aware of it, identifying your Power Hour can vastly improve your efficiency, and it’s time to use it to your advantage. Just work out when it is, and plan your day round it. As you’ll probably notice from looking at your own working patterns, this is the time of the day that you (or you should) tackle the biggest and most important tasks on your to-do list. It might seem like a minefield to determine when your Power Hour is, but it’s actually pretty simple if you start thinking about your working patterns. For example, when do you usually complete your biggest tasks? Is it at the beginning of your working day, just before or after you’ve eaten your lunch, or closer to end of the day? If you’re able to answer this, then you should have no problem knowing when you hit your peak, working-wise. If you’re still unsure, we recommend keeping a record of what you work on (and when) during a typical working day and week, as well as how quickly you completed each task. Do this for a couple of weeks, and you should be able to work out your natural Power Hour. From this, you can then start planning your day accordingly for maximum efficiency and productivity. However, did you know that epigenetics (the heritable change in gene function) can also have a say in when you’re at your most productive? “Since completing my Epigenetics Profile on the PH360 platform and finding out my natural daily rhythms based on my chronobiology, I’ve been able to make such a difference! Now you’ve determined your Power Hour, it’s time to get organised! 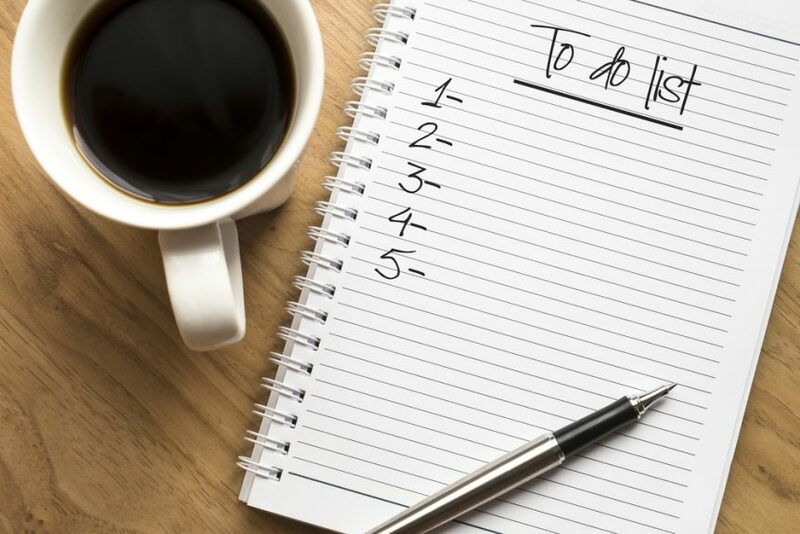 So, whether it’s at the end of the day or the first thing you do after you’ve switched on your computer and checked your emails (always do this first thing, if you can) start the rest of your day by making a to-do list. The most effective way to structure this is by organising your tasks by priority. To do this, you’ll need to ask yourself the following questions; What needs to be done today? What deadlines am I working with? Which tasks should be my highest priority? And finally; can any of these wait until tomorrow or even later in the week to be completed? To make things easier, a handy tip is to prioritise your work using the Urgent-Important Matrix (or the Eisenhower Matrix, as it’s also sometimes referred to). This is a four-section table where you organise your tasks list based on their importance and urgency. For example, a task can be important, yet non-urgent, or not important, yet urgent. 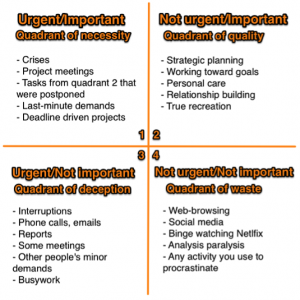 As the example shows, urgent/important tasks should be done first, and those that are not urgent/not important should have the least priority. It’s also important to remember that you should spend the most time completing your not urgent/important tasks to ensure they’re of a high standard. We all have a certain amount of admin that needs to be completed each day, whether that be simply checking and replying to emails, making phone calls, planning meetings or even sorting out paperwork. 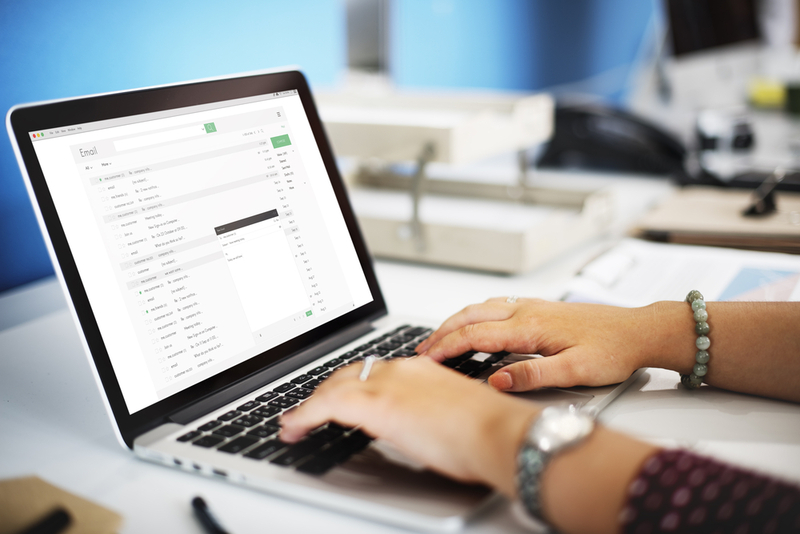 Although it’s true that most workers will check their emails as soon as they switch on their computer, (which is what we’d advise doing so you can properly plan each day’s tasks) other administrative duties should be reserved for downtime. Yes, they might take a while to complete, but they’re typically more methodical in nature and require less creative thinking. By reserving these tasks for downtime, you can give yourself the time to recharge your brain in a way, which should enable you to think clearer when tacking bigger and more creative tasks. “The Pomodoro technique is where you allocate 25-minute blocks for working, and have a 5-minute break at the end of each block. However, 25 minutes is too short for me, so I split my day into 50-minute blocks instead. The idea is that once you’re in a block, nothing happens apart from focusing 100% on the one task you have dedicated to it. If you’re lacking inspiration when working on a project, then it might be a good idea to use your Power Hour as a ‘creative period’. Put simply, this means setting aside some time to do some uninterrupted planning and creative thinking. This session can be either on your own or with a team; it’s all about how you feel you work your best! So, what’s the best way to go about this? Firstly, set an agenda; make sure you determine what exactly you want to achieve in your creative thinking session (for example, writing the outline for an upcoming project, setting a deadline or conducting some research into a particular topic). Once this is done, you can dedicate an hour or two to getting this ticked off your to-do list. Having a set creative period when you’re at most your most productive will help to ensure you achieve more in a shorter timeframe, which increases your productivity and helps you feel more accomplished. 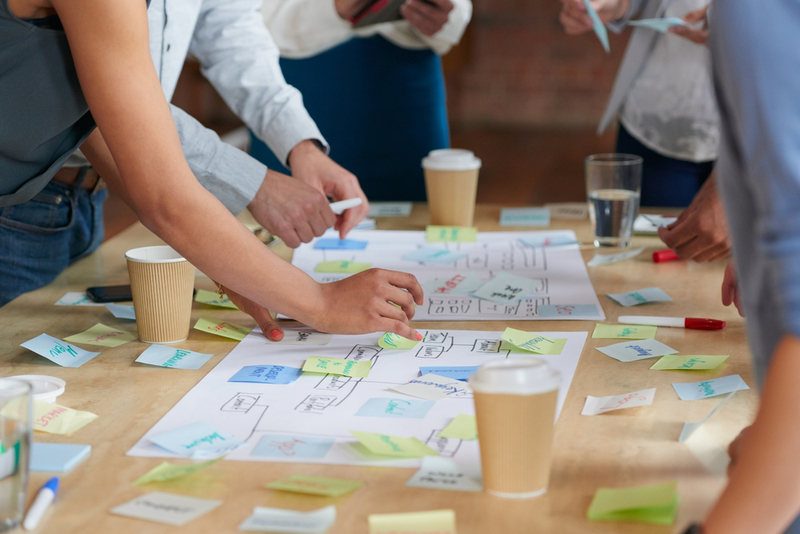 However, it’s important to realise that not everyone works in the same way, and not everyone will be able to utilise their Power Hour for creative thinking sessions. In fact, you might find more success by choosing to bounce ideas off other members of your team at times when productivity is low. Sure, this may seem counterproductive, but getting others’ input should re-jog your creativity and help to re-motivate you! Now that you’ve found your Power Hour, it should be easy to prioritize your workload, work at your most productive, and achieve as much as possible in your working day!